Miss Harper is a 3 year old, 3 legged pit bull with a harsh past. As you may already know her story, her previous owners were convicted of a felony for mutilating her by cutting her ears and leg off. Based on her tragedy she still maintains her sweetness but has suffered some setbacks behaviorally. She was in a foster home where she had no boundaries and learned bad habits and was involved in a biting incident. She was initially taken to a training facility in New England where she learned basic commands. 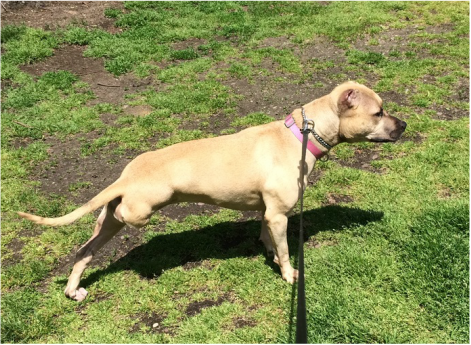 She is now currently working with a behavioral trainer(NYDW) and looking for a foster home to maintain her transition into living a structured lifestyle. The foster and/or potential adopter will be someone with no other animals, lives alone, has a secure fenced yard and is committed and willing to work with Miss Harper and follow and continue her training protocol.